What I did not know about the MDR Hotel, Lop Buri, was that it was 2-3km down a dual carriage-way with at least three lanes of hooning traffic in both directions. With each revolution of my pedals (no longer tired after the 87km now that the adrenaline had kicked in) I thought ‘f*ck’ as another car, truck or weaving moped sped by, until the word played on loop. But, we finally found the MDR, checked in, shackled our bikes and tucked into the mini-bar. 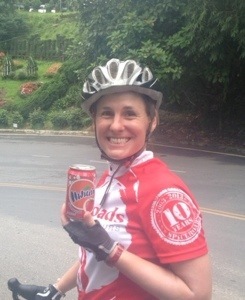 What I did not know then was that my relationship with red Fanta and the post-ride mini bar was to be a consuming and enduring one. 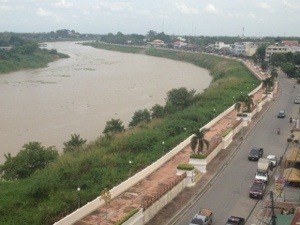 What I also did not know was that to get north to Chai Nat, Uthai Thani, Nakon Sawan, we had to pass through Sing Buri. Sing Buri was 40 – 50km away and happy, exhausted, still consumed by trepidation (I speak for myself here), I realised the next day’s ride would be to Sing Buri. It slowly dawned on me that our first day’s effort had been in vain. What I did not know (but would regularly be reminded of) when trying to plan the second leg, was that the GPS could not be relied upon. While it has a bike setting, the app could not devise a bike ride to Sing Buri that did not retrace kilometres of road towards Ang Thong. The only obvious road was the rather busy looking 311 but for some reason the app did not think it was suitable for a bike. Computer say no. I’m lazy. The 311 is straight, sure and only 33km. Only, Nick did not fancy it. 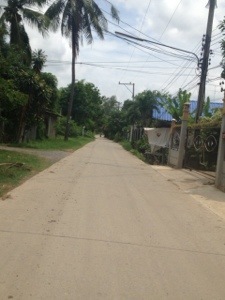 Instead, the next morning, while heading towards the 311 (because there was no way I was heading back towards Ang Thong) we stumbled across a set of side roads that run parallel with it, through lush, well kept villages that run along the side of the Lop Buri river. Rolling through the Thai countryside. I think this ride was the one and only time that I felt part of one of those epitomous cycling scenes; gentle breeze through the hair, smiling, the world smiling with us (and waving and shouting in the case of the locals) and no gruelling effort-filled sweat drenching our flesh and clothes. We continued to roll all the way along the Chao Phraya River, to the door of the Chaisaeng Palace; literally the only place to stay in Sing Buri. View of the Chao Phraya River from the hotel window. The silty appearance reminded Nick of ‘Nam. 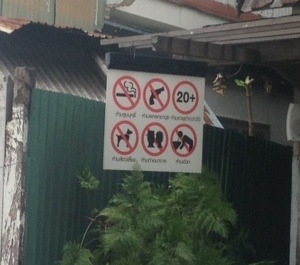 What I did not know was that staying in Sing Buri would be like treating myself to a holiday in Mansfield or Grimsby. Whether it would have mattered, had I known, is another thing entirely. Both Lop Buri and Sing Buri are cities of industry. They really don’t see tourists, Sing Buri less than Lop Buri, I think. With its huge local market, a tarp and post labyrinth through a bounty of fish guts, squid, chicken legs, grinning pig’s heads, garlic, ginger, fruits, tools, bungee cords, ponchos, bagged up sauces, meat on sticks, deep fried chicken, its gaudy karaoke dining, rammed, disorganised department store and packs of territorial mongrels, it was clear that this was a functional town with no particular want or need for tourists. A functional sign outside a bar; my kind of place. Mansfield, Grimsby or anywhere, that was what I came for. The smiles and good service were important and the place did not disappoint. 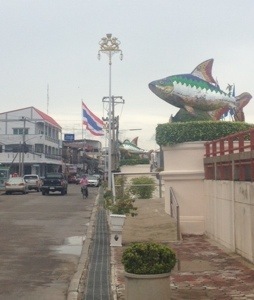 The glittery fish of Sing Buri; the envy of Grimsby. We stayed an extra day. Not because we were captivated, because we were trapped, by what turned out to be a very small amount of rain. What I did not know is that while we ambled the market looking for the best bike specific poncho, eating meat on sticks and avoiding karaoke joints and Mister Donut, my bike was in the hotel store room with one flat rear tyre (the second so far). So the next morning, imbued with enthusiasm and armed with coloured ponchos for the third leg to Uthai Thani, the first task was puncture repair.